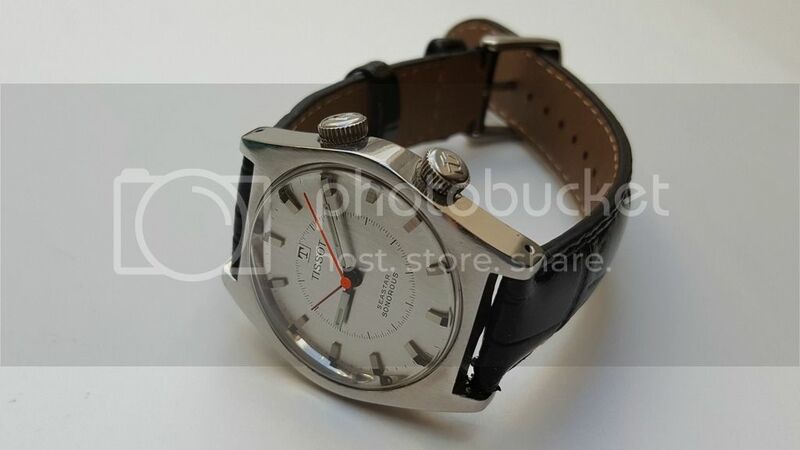 All, I came upon an old Tissot Sonorous and decided to restore it. I thought I would document and share. 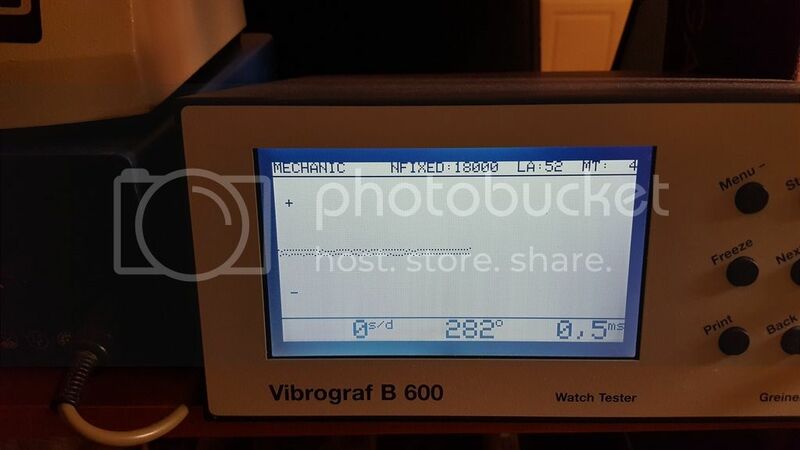 At first glance, the case is in good shape with no big dents or dings. Both crowns are in great shape, and are original and signed. There's a lot of dirt and debris, but it appears manageable. I get the case off to have my first look. It's the classic AS1475 alarm movement. I've read this has a reputation as being a quality alarm movement, and I believe was even used in some early Rolex Tudor alarm watches. 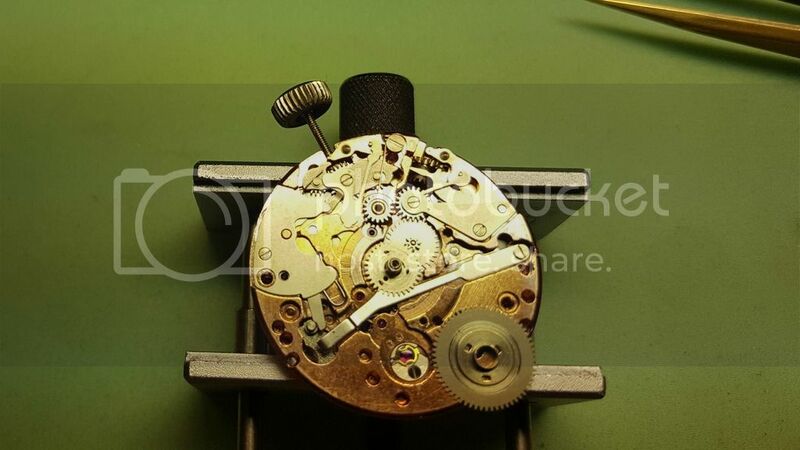 This is indeed a beautiful movement, with gilt bridges and plate. It's dirty, but nothing appears to be in bad shape. 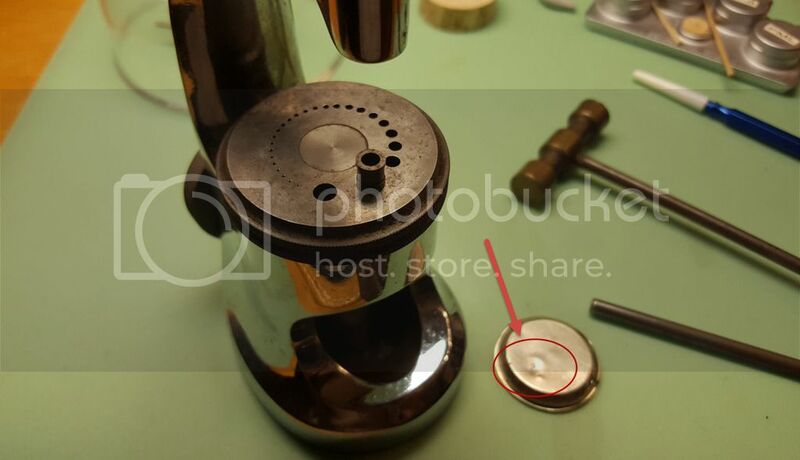 After closely examining the screw heads, I see little evidence of previous removal, which tells me it probably hasn't been cleaned too many times. I also can tell we'll need a new gasket, which isn't surprising. ...taking the two stems out, paying close attention that one is longer/different than the other. 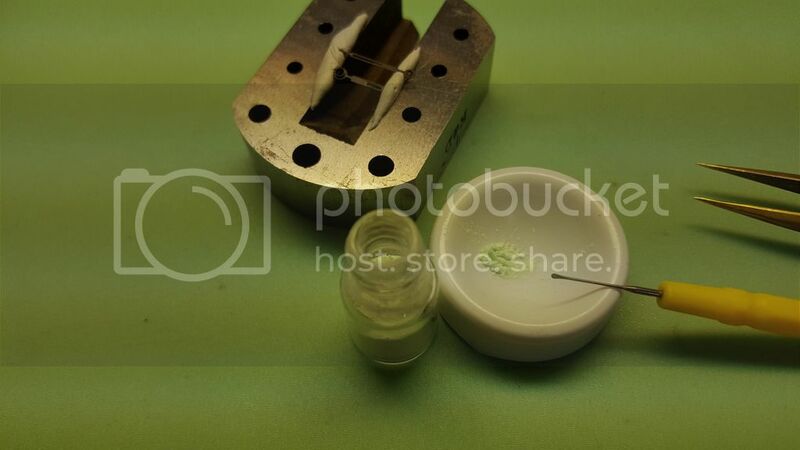 I'll place these crowns with their "closest relatives" in the parts tray to save comparison time on re-assembly. 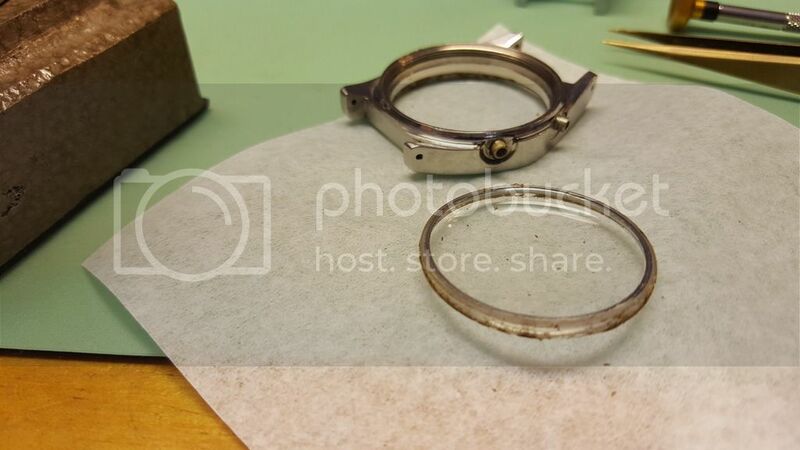 You can see the built-up dirt and deteriorated old crown gasket easily...I'll have to clean both of these with the parts washer and probably a fiberglass pen. Otherwise, they are in good shape and won't have to be replaced. 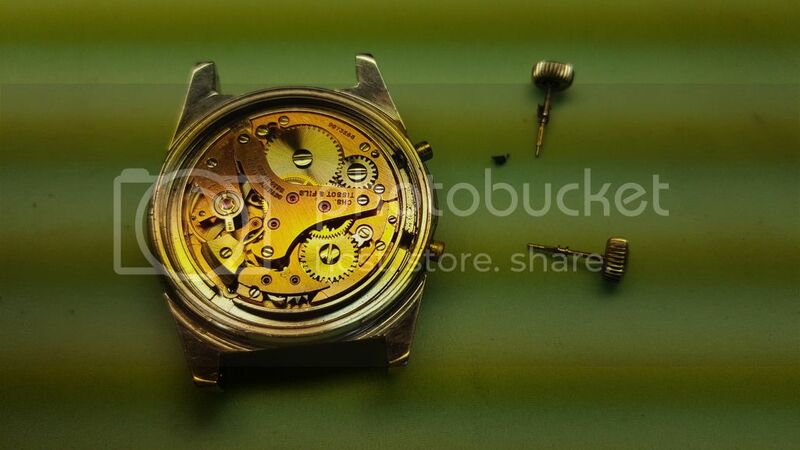 Luckily, I don't see any crown gasket residue inside the movement. In many situations, the residue ends up moving down the crown tube and really makes a mess of the movement--but not this time. I see a little bit of light corrosion on the dust/ringer cover, a little attention from a fine-point fiberglass pen help this a little. I will still throw it into the parts washer along with the case, other parts, etc. 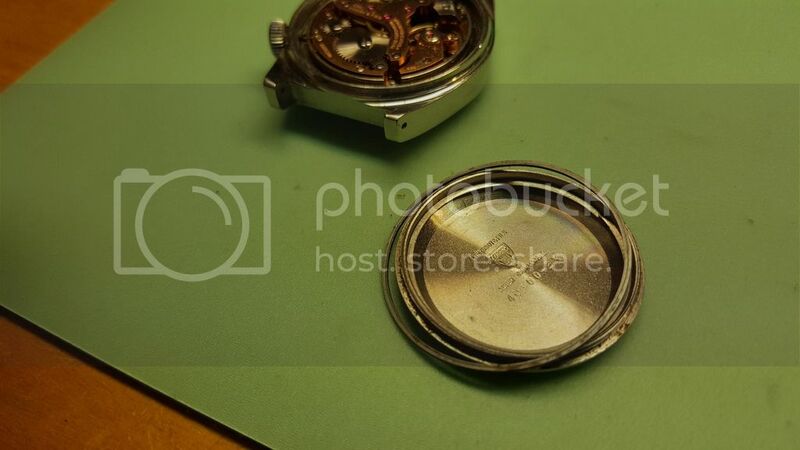 Taking a closer look at the case, I can see a lot of dirt that has built up over the years. I take my larger fiberglass pen and a sharp piece of pegwood and remove as much of the dirt and light corrosion as I can. Incidentally, I bought this figerglass pen a number of years ago from an auto parts shop. This model is used to lightly remove paint scratches from cars. One of the more difficult things so far was getting the alarm indicator hand off. 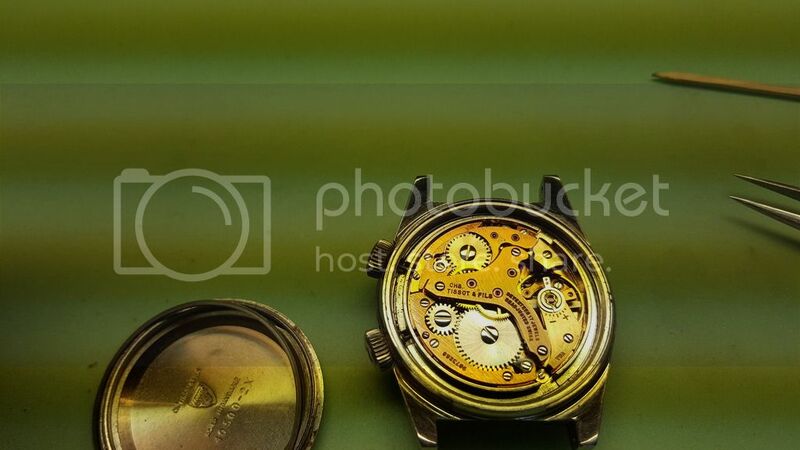 It was extremely close to the surface of the dial. Not that surprising given this watch has 4 hands stacked on top of each other. 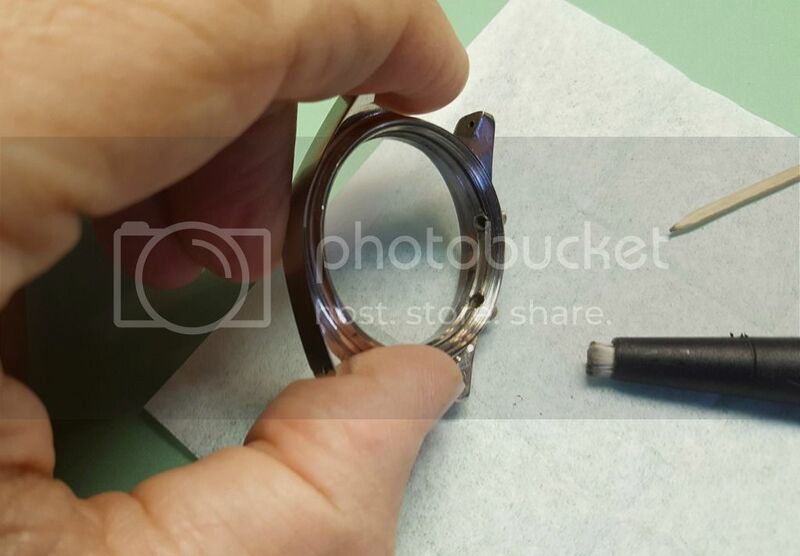 After some careful protective measures and a pair of polished hand removers, I was able to remove it. 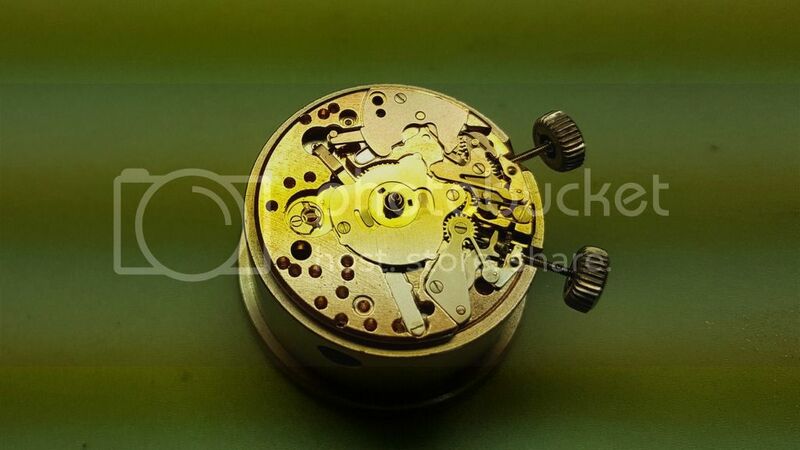 As you can tell from the picture, the prior watchmaker was not as patient perhaps, as there is evidence of some prior prying. Fortunately, it isn't bad enough to really see with the naked eye. 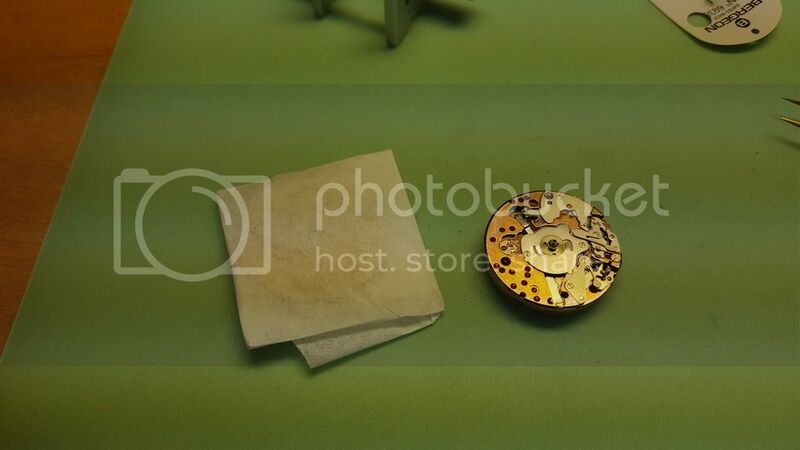 ...taking the case ring away from the movement and dial...paying close attention to which side is which, for re-assembly. 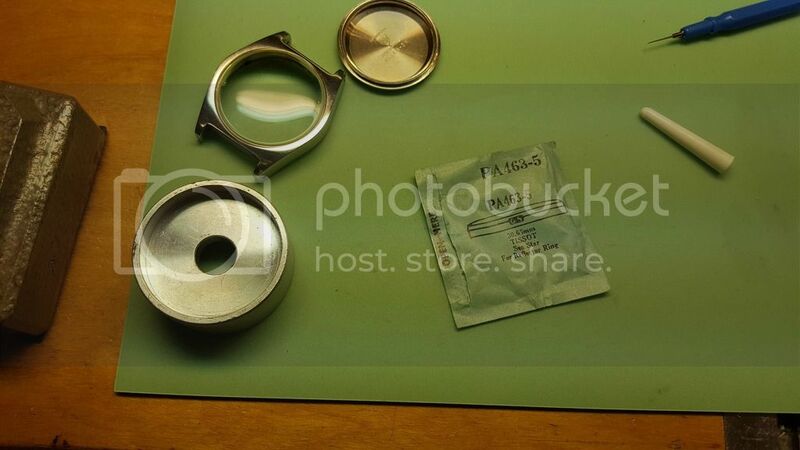 Let's be sure to protect the dial, this is best done by carefully wrapping it in some watch paper and putting back into the tray. Given the crystal is well worn, and has a small crack, I want to find a replacement. 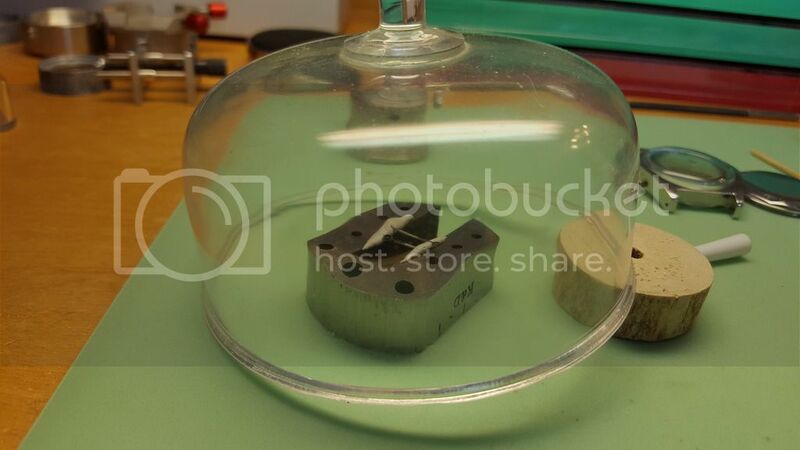 But first I have to push the old crystal away from the case. 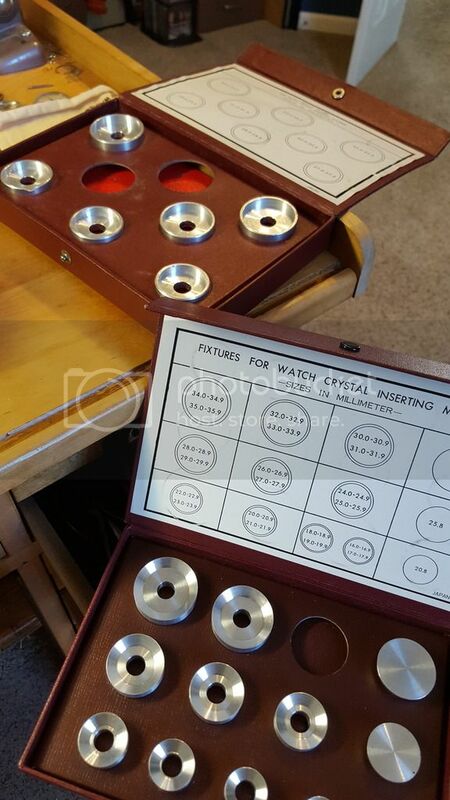 To do that, I break out my trusted old friend, my BB crystal press and die set. 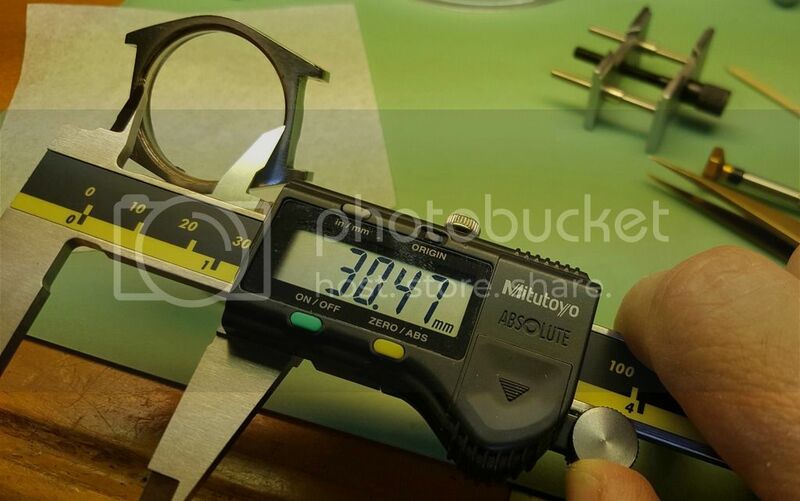 After doing some basic measuring and comparing, I've chosen a die that will hold the case. I choose a proper base die to support or cradle the case, and then select a large diameter press piston to force the old crystal out. 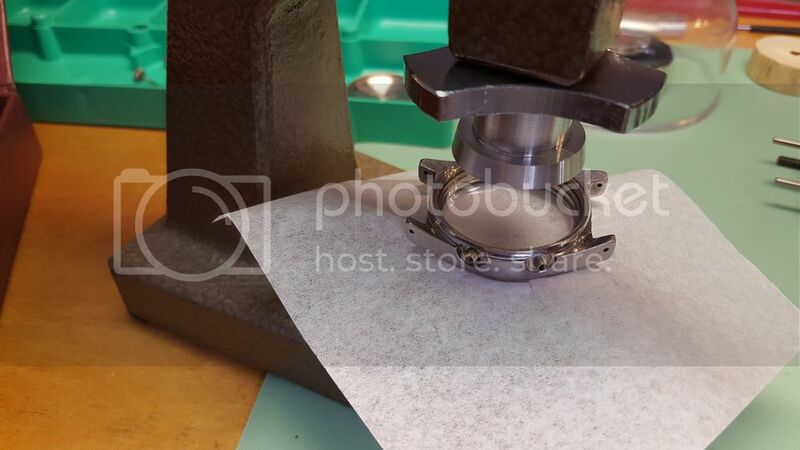 I carefully place the bottom die and case onto the press, again ensuring I have a piece of watch paper correctly positioned between the die and case. 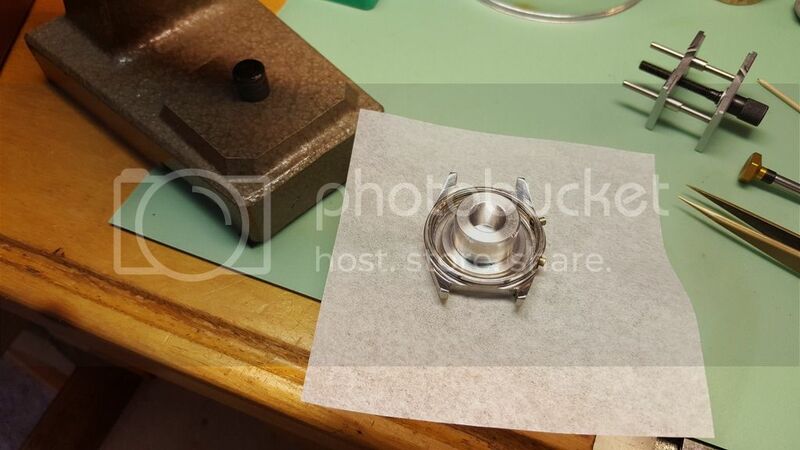 With a piston die inserted into the top of the press, I carefully and slowly apply pressure to pop the crystal out. It's obviously critical to have everything perfectly level. 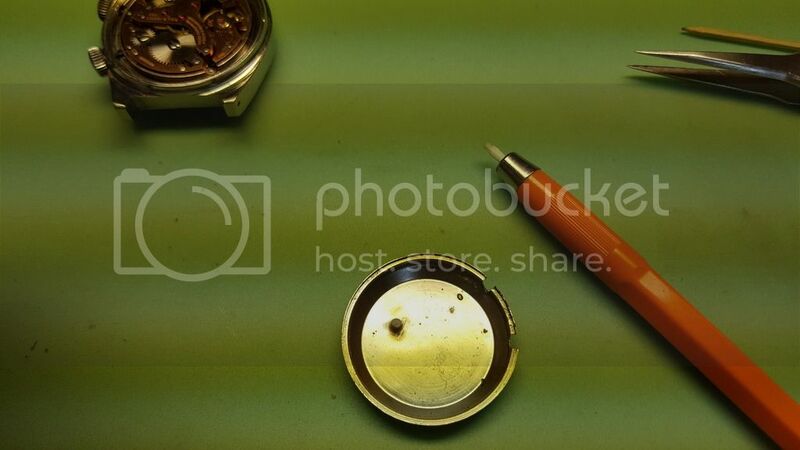 I scrape away the grime and dirt with a watchmaker's knife and a brush. From here I focus on taking the movement apart for cleaning. I want to pay special attention to the alarming mechanism that this movement is famous for. 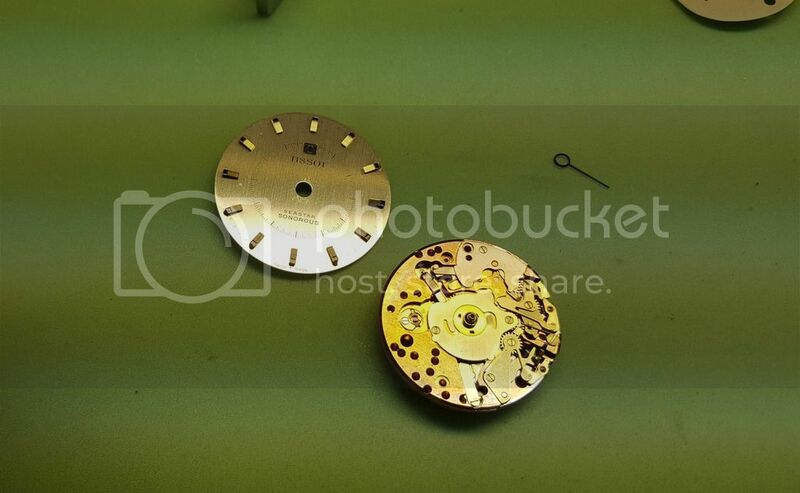 Here's a view with the locking wheel assembly removed on the dial side. 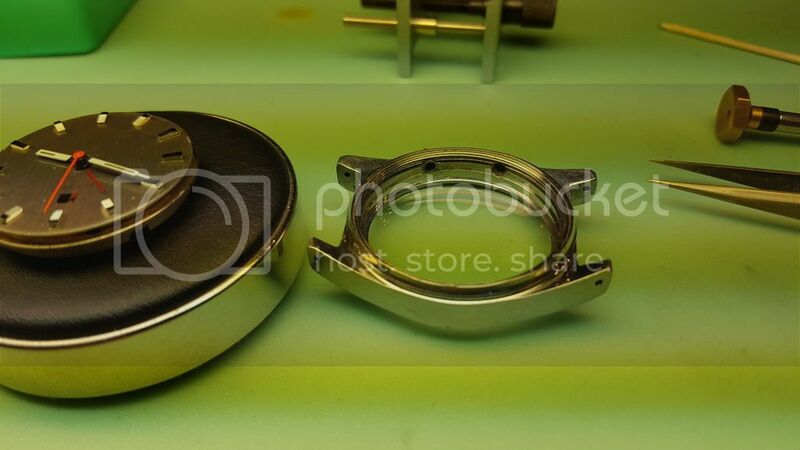 Here's a good look at the separated locking/unlocking wheels. These are designed to snap together when they are precisely aligned. The bottom wheel has three raised notches or cams, which rotate under the top wheel, which in turn has three corresponding holes to align. I'll have to remember to put a bit of D5 or PML on these to help with the constant rotation and friction. Notice that each hole is a different distance away from the center of the wheel. 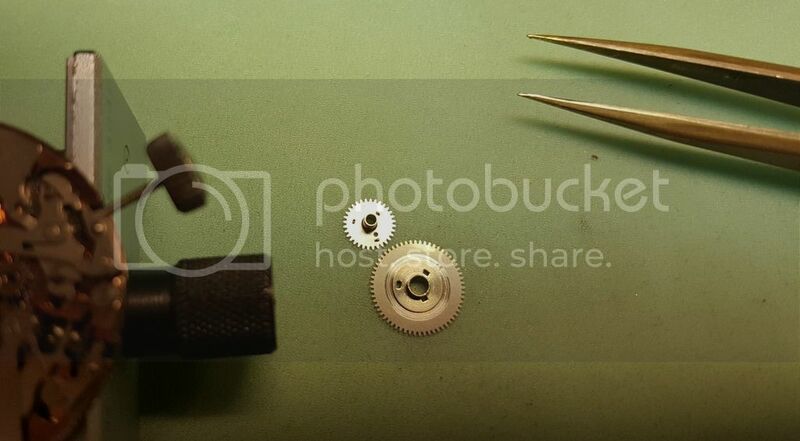 This is the heart of the alarm mechanism. After removing the alarm unlocking wheel assembly, you can get a good look at the rock bar. This is one of the keys to the movement. It basically moves up and down as the hour wheel rotates over a 12 hour period. When the lock/unlocking wheels fall together (indicating the "alarm" condition), the rock bar pops up, allowing the hammer to freely vibrate. As the hour wheel continues to rotate, the wheels separate again, pushing the rock bar back into place and preventing the hammer from moving. 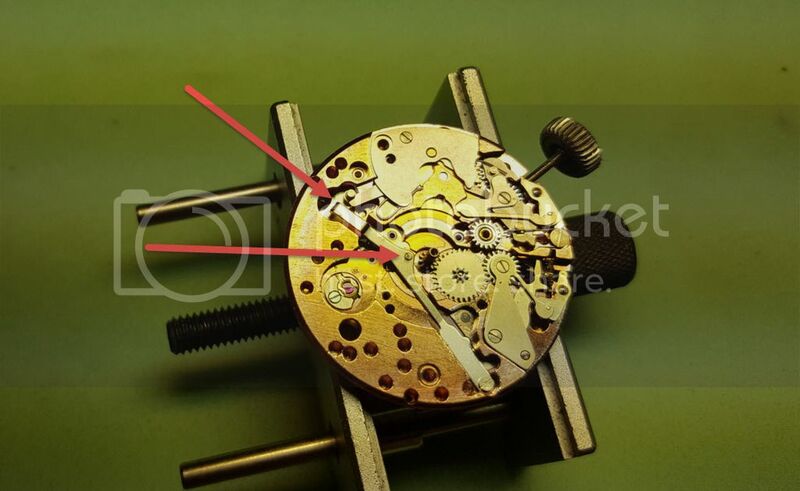 As you can see, this movement uses a second barrel and mainspring that serves simply to vibrate a hammer via a heavy-duty escape wheel. Here's a complete look at the rock bar. 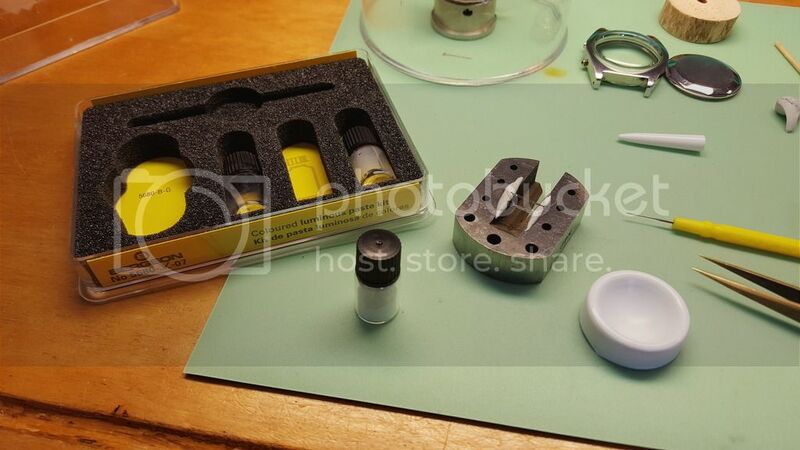 I will have to remember to put some heavier grease, probably PML, on the cam section which is where the locking wheel assembly sits and rotates upon. I manage to completely disassemble and segment my parts before cleaning. I didn't like the condition of the lum on the hands. It was starting to crack, and at some point material will break away and dirty up my new clean movement. I decided to re-lum now while I had the chance. First step was to clean all the old luminescence off the hands. Then I take some old rodico and make two rows on an anvil to support the hands in a "bridge" like fashion. ...gradually shake out a bit of lum material into the mortar. After getting the right mixture together, I fill in the slots on the hands. Be sure to make special effort to use the surface tension of the fresh lum to your benefit and "drag" the material across the opening. It will take a couple of swipes for each hand to get a good solid, consistent bead laid down. 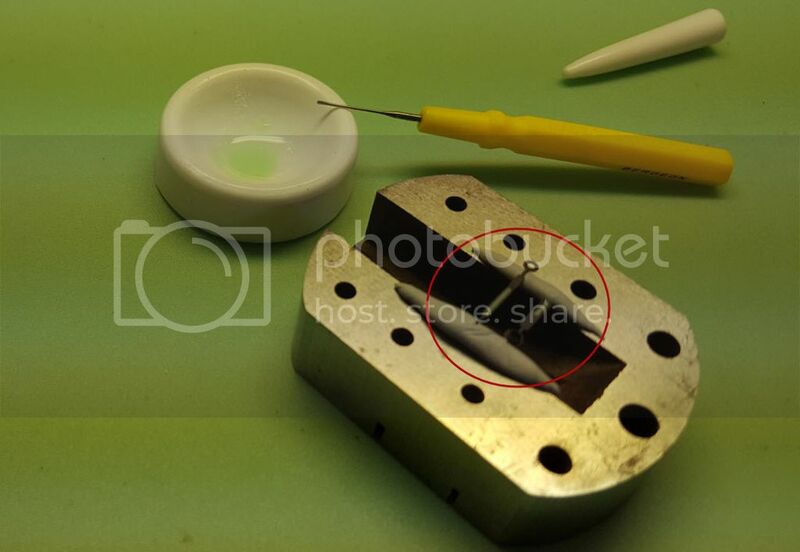 The key is to ensure the rodico doesn't touch the open slots or the mixture. Once satisfied, I place a dust cover over the freshly-lum'd hands, and prop it up so air can circulate and help with drying. Time to find a new replacement crystal. After doing some research online and in my catalogs, I settled on what is probably the best fit. 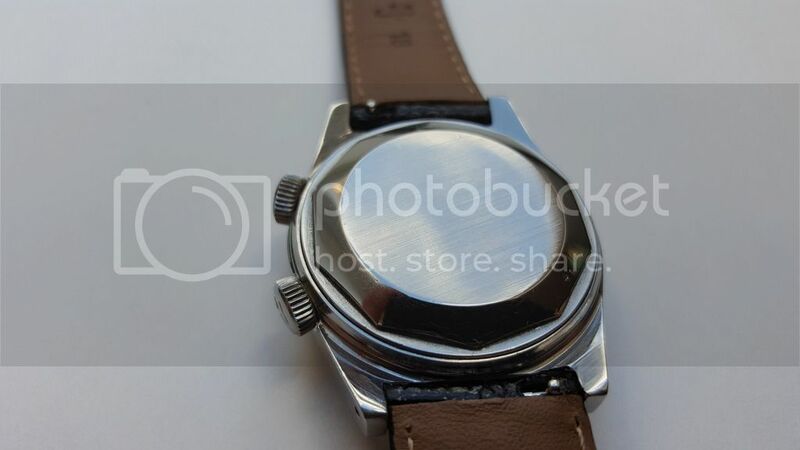 The GS reference doesn't refer to a Sonorous, but the reference to a Tissot with a reflector ring is close enough. It's probably the same from a factory perspective. 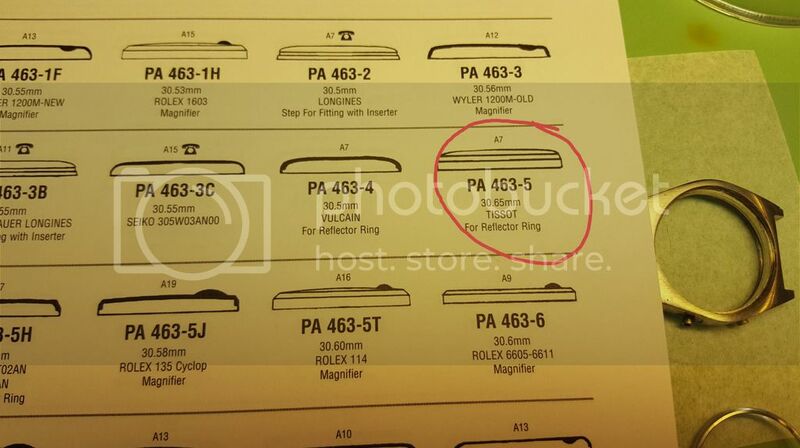 A PA463-5 should be ok. 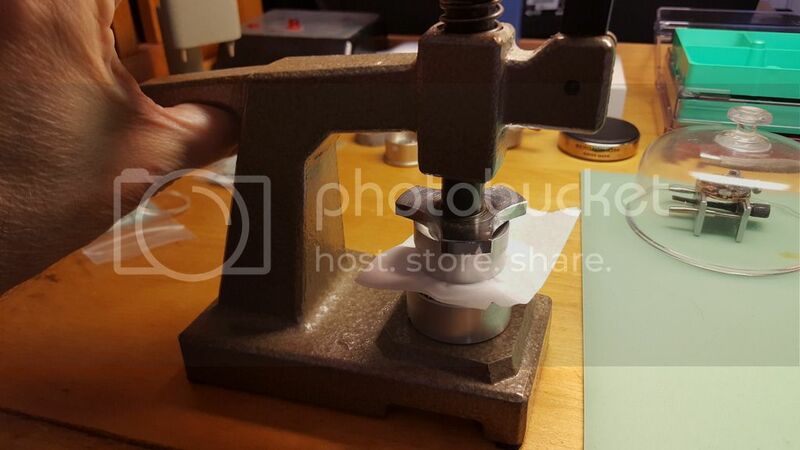 Pressing the new crystal in, I use the same basic setup as before with my crystal press. 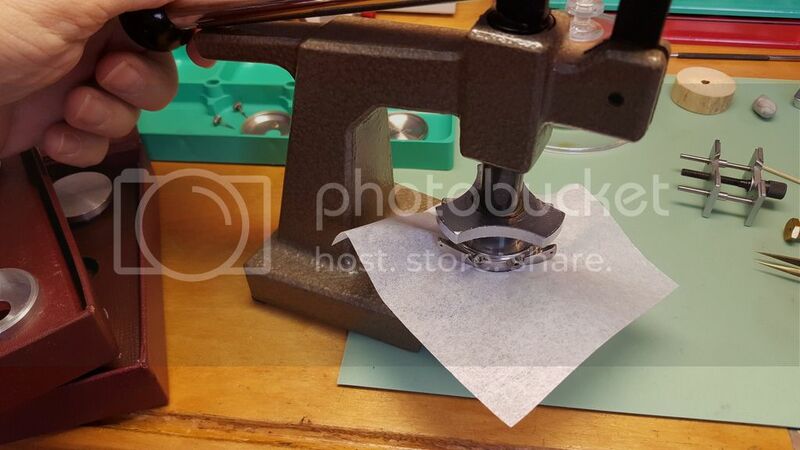 First by finding the appropriate base die to cradle the case, then find the correct beveled die to push the new crystal down into the bezel. 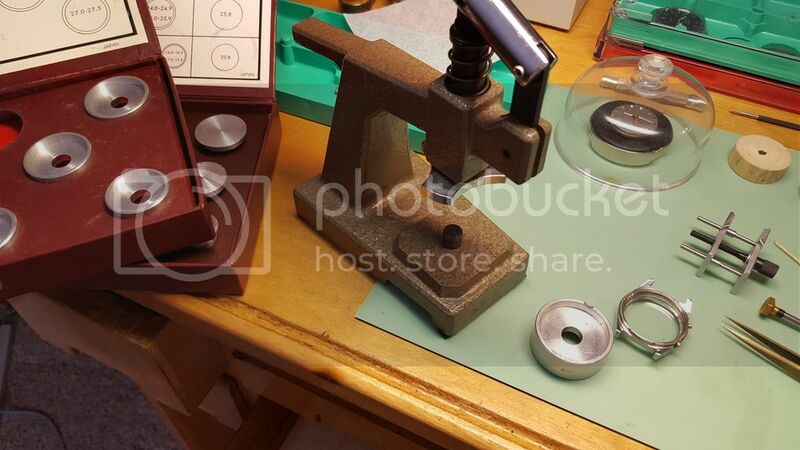 Again I like to put a piece of watch paper between the die and the new crystal to help cut back on accidental scratches. With some adjustments, looks like the movement is doing well. 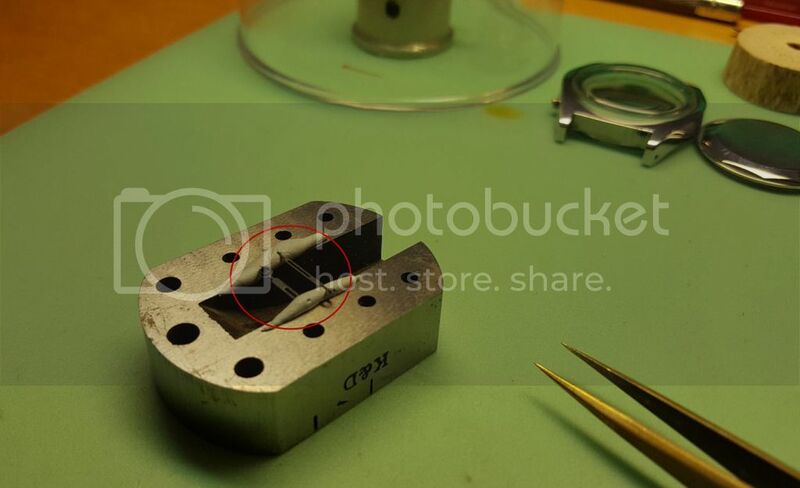 The beat error is more than I would like, but with this particular balance bridge, you have to adjust the collet--there is no adjustment on the bridge. I decide to leave well enough alone. Movement all back together, cleaned, and adjusted. New crystal is installed. 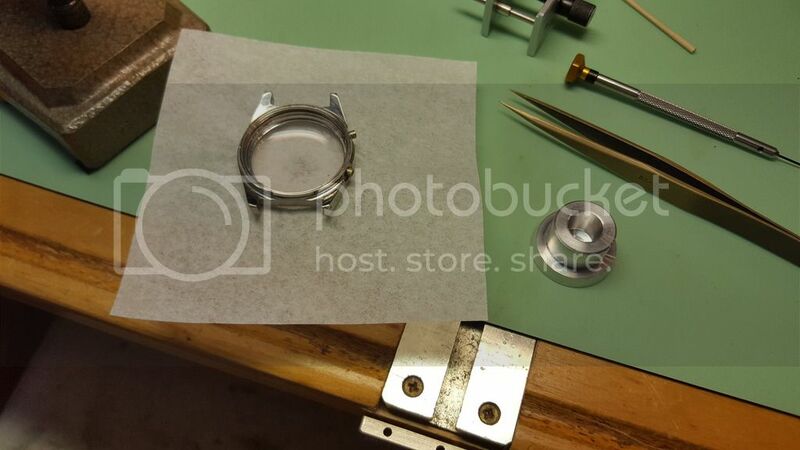 Now we're ready for the dial, hands, and casing. 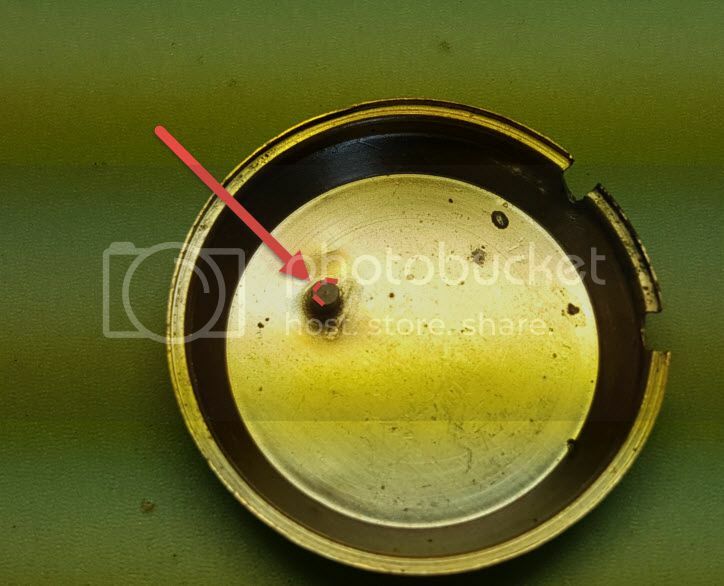 Before I focus on re-casing, I have a closer look at the dust cover/bell. In observing the ringer stud, I can tell that someone probably tried to adjust the distance between the hammer and stud by bending the stud. You can see that it's a bit kinked. To fix this, I had to break out my staking set. 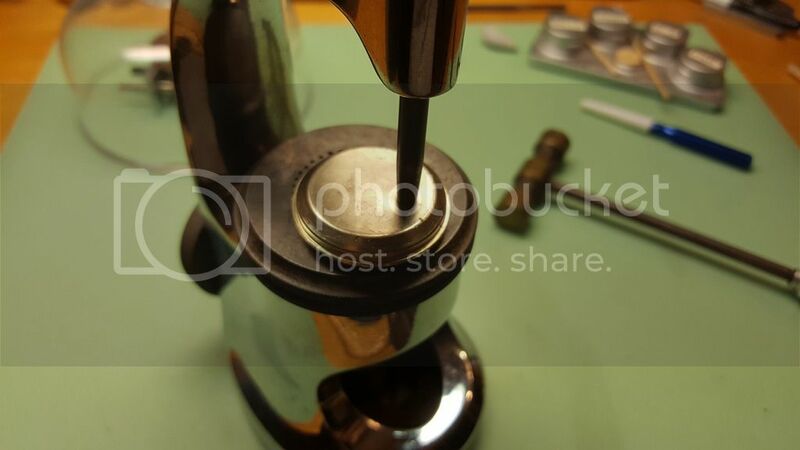 I found a hollow stud to place the cover on that had a hole big enough to fit the cover stud into, but yet be wide enough to allow some of the metal around the stud to be flattened out a bit. I then find an appropriate flat hole punch to fit on the top side of the cover, this will allow me to flatten out the target easily. ...Not too much pressure, no big hits, just a few short taps and observe the effect...may take a few times before it's done. After straightening and flattening out the ringer stud and cover, I do a bit of testing of the hammer and alarm stud and discover that there isn't enough clearance between the hammer and stud, preventing the hammer from vibrating back and forth, and keeping the alarm from sounding. 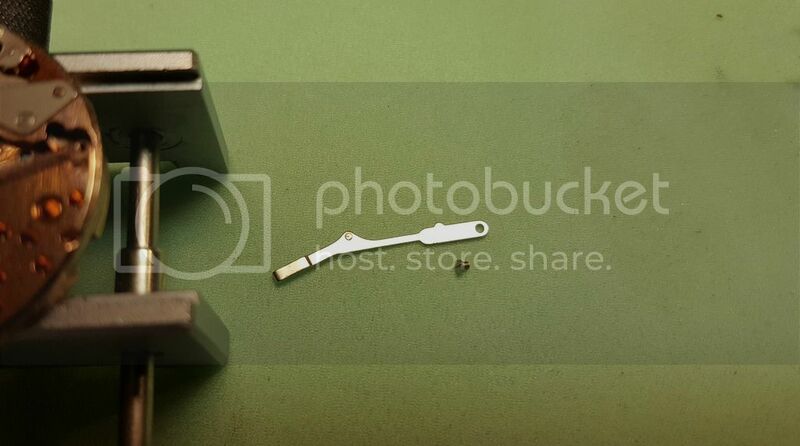 This makes sense now as to why the stud was bent. I decided to take a dremel and round away a bit of the stud's diameter to achieve the same result. 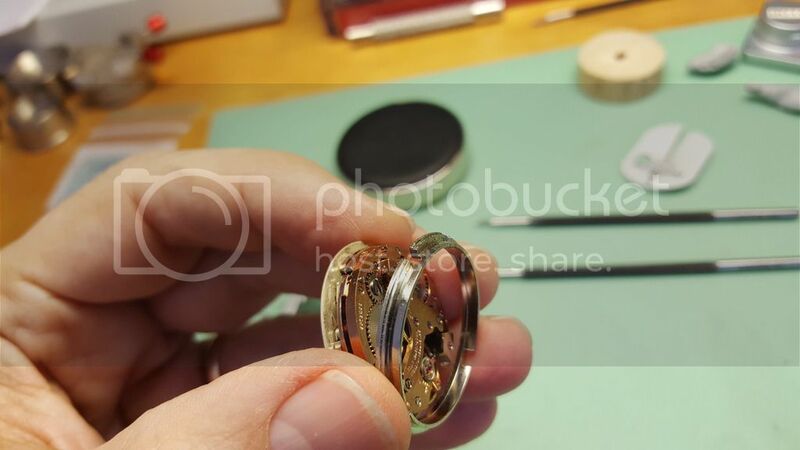 I felt this was the best way to handle, since I wanted the cover to fit correctly back onto the movement and allow the caseback to sit flush against the cover when I closed the case. After a few trial-and-error sessions with the dremel and testing the alarm, I got the desired result. I'm coming around the turn in finishing this project. 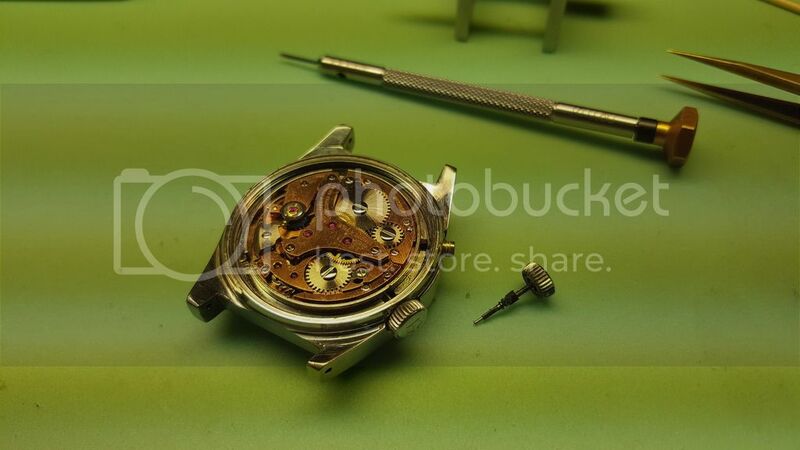 I place the case ring into the movement carefully, ensuring I don't torque the dial or movement. I put back in the case screws and tighten down appropriately. The home stretch. Just need to do one more glossing over with some clean rodico to remove any trace of my fingerprints or lingering dust, and we're ready to put on the cover and caseback. 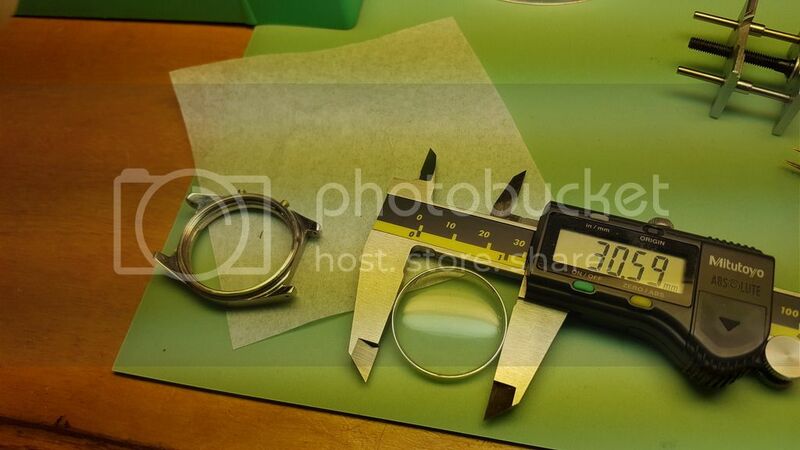 I carefully measure the inside and outside diameter of the caseback, and fit a new flat gasket. 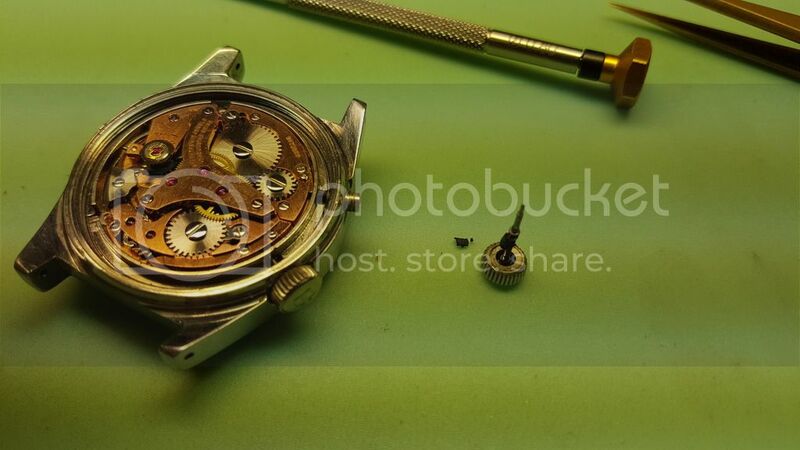 After putting a bit of silicone grease on the new o-ring, I screw on the caseback and tighten appropriately. I give it another round of testing on the timing machine to make sure I haven't moved the regulator or jarred something loose. 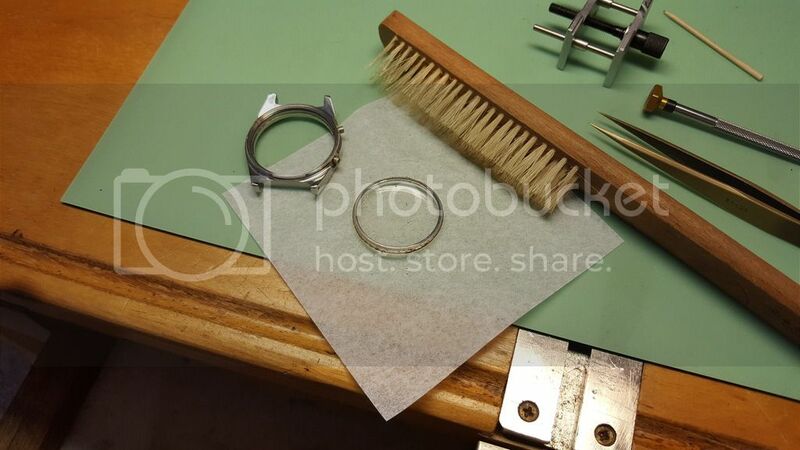 Adding a new leather strap and giving it a good final polish with a clean polishing cloth, and it looks pretty good! Overall I was pleased with the outcome. 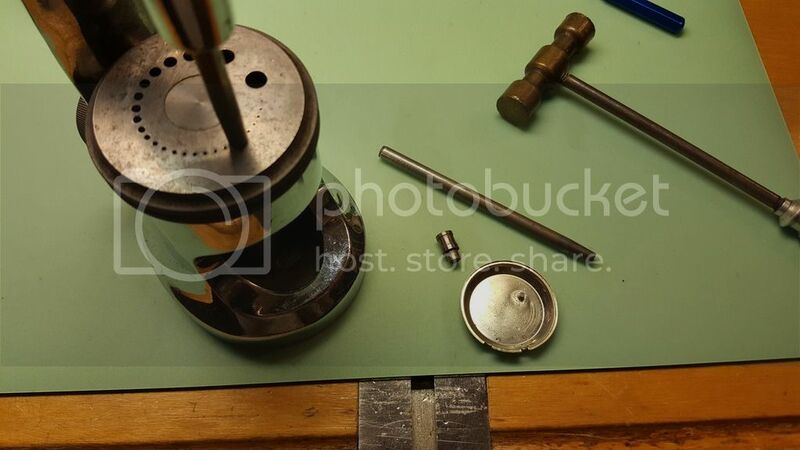 Other than having a click spring fly off my bench (I eventually found it) this overhaul was not too difficult. 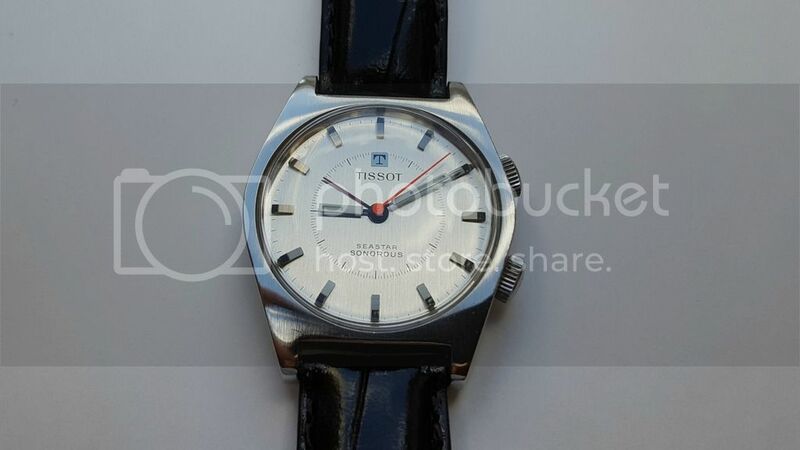 I'm pleased with the overall condition of this vintage Tissot. 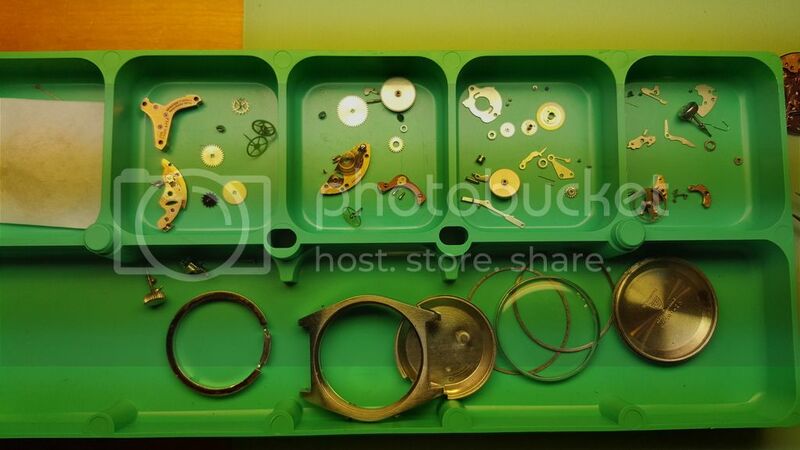 Previous Topic: Huge haul of watch parts ! Help needed.